Justin South garnered the pole for the Allen Turner Hyundai Snowflake 100 during pro late model qualifying on Saturday afternoon at Five Flags Speedway. 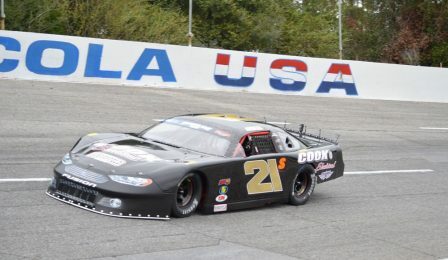 South rocketed past two-time Snowflake runner-up and reigning Snowball Derby champion John Hunter Nemechek with his lap of 16.554 seconds (106.735 mph) just past the halfway mark in the 57-driver field and held the top spot the rest of the way. In scoring his second-career Snowflake Pole Award, South dedicated the effort to his late grandfather, who his No. 21 machine is named after. Nemechek’s lap of 16.579 (108.571) was good for the number two position, and he will start alongside South on the front row as he looks to avenge his recent near-misses in the pro late model classic. A surprising run for young gun Bobby Knox III (16.607/108.388) left him third on the speed charts, followed by defending race winner Bubba Pollard (16.613/108.349) and Dwayne Buggay (16.616/108.329). Three-time Snowflake winner and former NASCAR XFINITY Series champion Chase Elliott followed that group with the sixth-fastest lap (16.617/108.323) on the board, a disappointing result in the eyes of the Dawsonville, Ga. native. The top 30 cars made the race on speed, with two disqualifications (Brandon Setzer and Zachary Knowles) outside that group coming for violations of the post-qualifying impound procedure. R.S. Senter was the last driver to make the show on speed in 30th, while Scott Hantz (31st) and 2014 ARCA Racing Series champion Mason Mitchell (32nd) were the first two drivers below the cut line. Along with Hantz and Mitchell, other notables who were bounced into the 50-lap Last Chance Showdown included Kyle Busch Motorsports’ Kaz Grala (34th) and former Five Flags Speedway track champion Garrett Jones (42nd), who battled alternator problems throughout the day. Once that event began, it was Grala charging forward to pick up the victory and transfer onto the main event, ahead of Hantz, former PASS Pro Late Model competitor Chandler Smith and Setzer, who came from the back to barely make the 100-lap finale. Jones came from the rear along with Setzer following his team changing the alternator before the start of the LCS, but came up one spot shy of moving on in finishing fifth. Mitchell also failed to advance, coming home 12th. The Allen Turner Hyundai Snowflake 100 is scheduled for an 8 p.m. ET/7 p.m. CT start time. Bubba Pollard is the defending race winner.